Time2Track is a web-based tool for tracking and managing training hours. Trainees track their hours in Time2Track, Supervisors, and Faculty approve hours, and Organizations monitor the entire process. Forms and evaluations can also be completed in Time2Track. 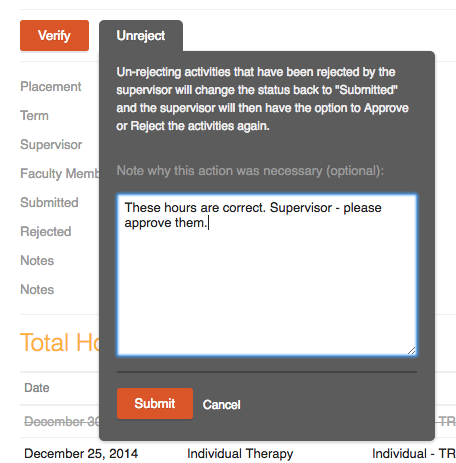 Faculty members use Time2Track to verify supervisors' approval of trainee hours. They can also monitor their trainees' progress with reports and approve or reject hours on behalf of a supervisor (if needed). 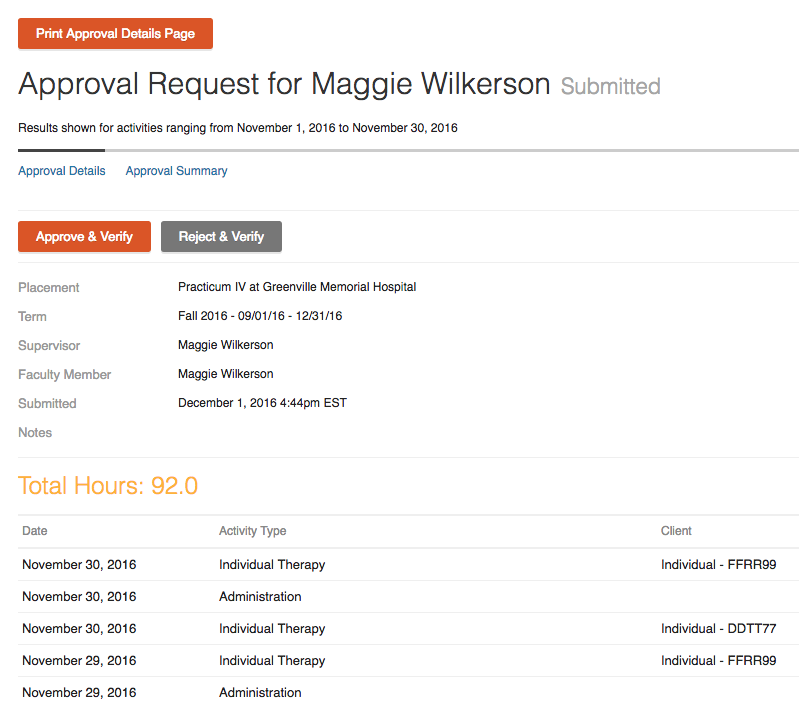 Online Approval allows trainees to submit Time2Track activities for approval electronically. Supervisors can sign off on hours and faculty members can verify hours electronically through Time2Track, which cuts out the need for paper copies and physical signatures. The entire process is tracked in Time2Track so institutional administrators can stay on top of the status. 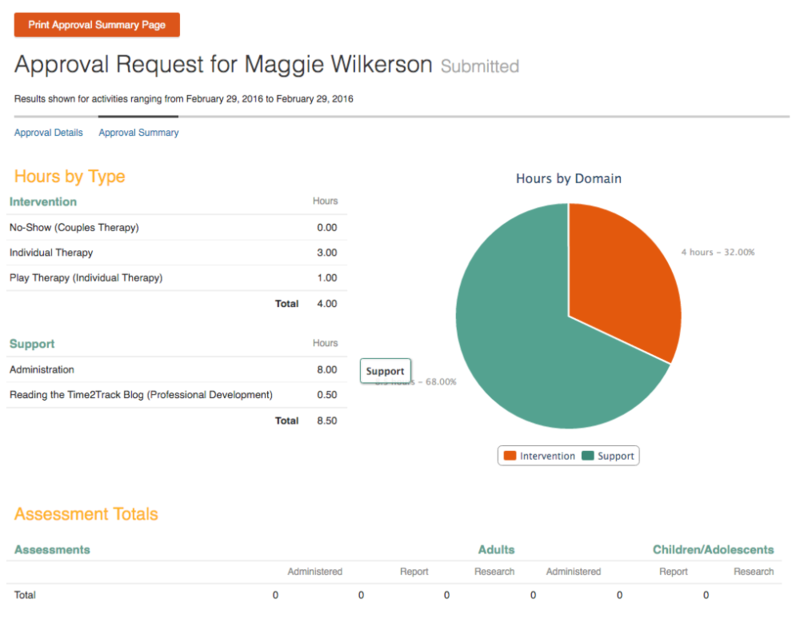 Online Approval is currently only available to Time2Track Institutional users, their trainees, and their associated supervisors and faculty members. If you are interested in using Online Approval, please contact us. First of all, to use Time2Track as a faculty member, you'll need to be invited by your institution, school, or program. When your program invites you to use Time2Track to approve trainees' hours, you will receive an invitation to set up your Time2Track account. You won't see any trainees in your Time2Track account until they give you permission by adding you to a placement. Your Time2Track Faculty account allows you to view and monitor your trainees who have identified you as their faculty member. Trainees choose a faculty member for a specific placement, so you'll see all hours for the placements that trainees have associated you with. You can use Time2Track to view individual progress and reports for your trainees. 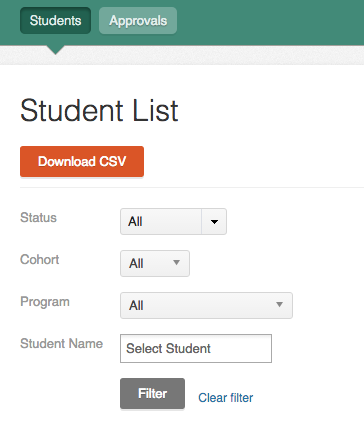 Click Students to view a list of your trainees in Time2Track. An individual's Status refers to the status of their Time2Track account. Pending means they have signed up for a free trial of Time2Track, but have not activated their account with a subscription using a credit card or authorization key. Active means they have activated their account with a subscription using a credit card or authorization key. And Expired means their Time2Track account has expired. 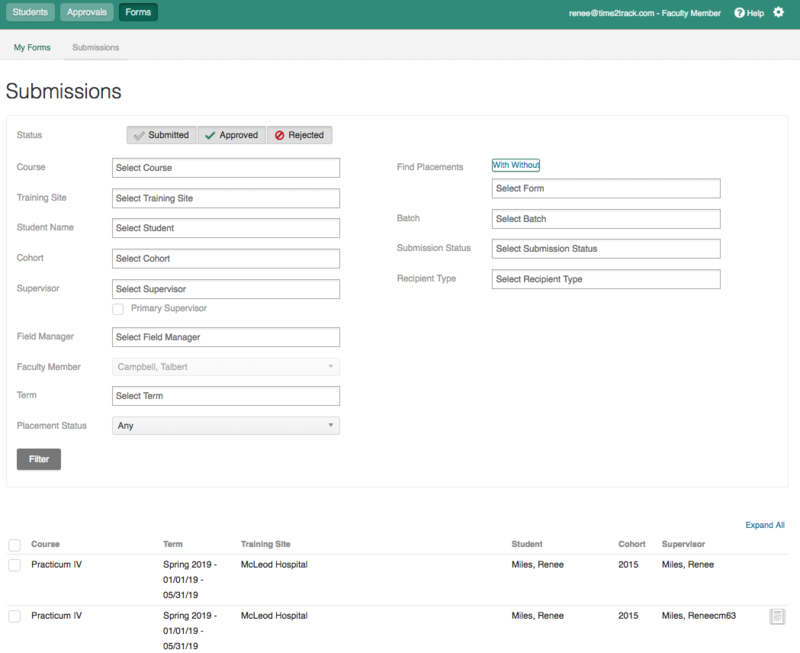 Use the filtering options to filter your trainee list or search for a specific person. You can also export this list by clicking Download CSV. Click a trainee's name to view their account details and individual progress reports for that person. 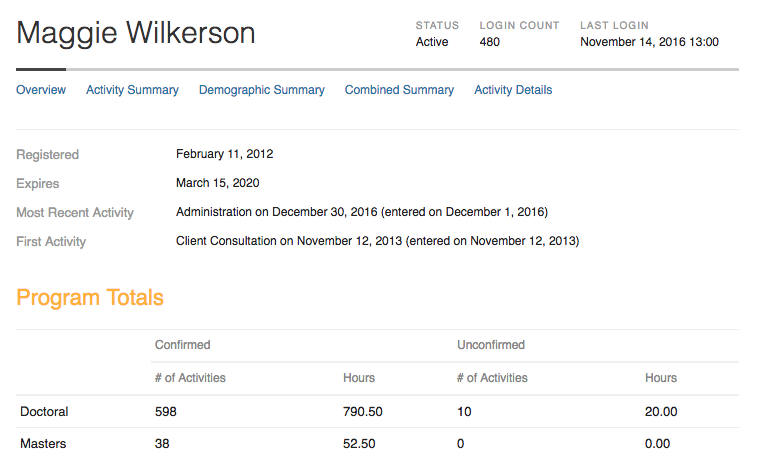 In Time2Track, trainees will log their hours then submit an approval request to their supervisor. 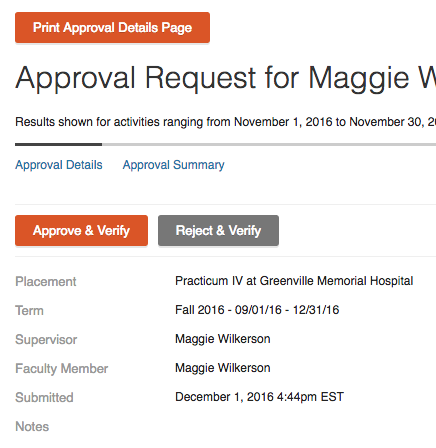 Once the approval request has been approved or rejected by the supervisor, you – as faculty – will have the ability to verify the approval request. 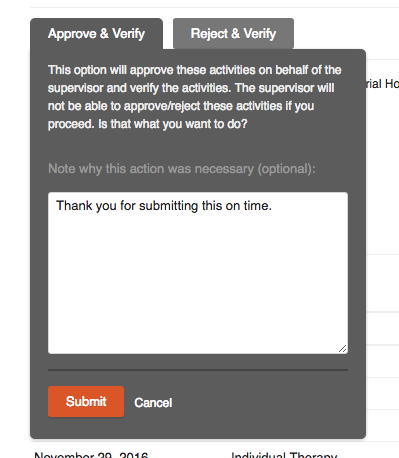 To review an approval request, log into your Time2Track account the and click Approvals. 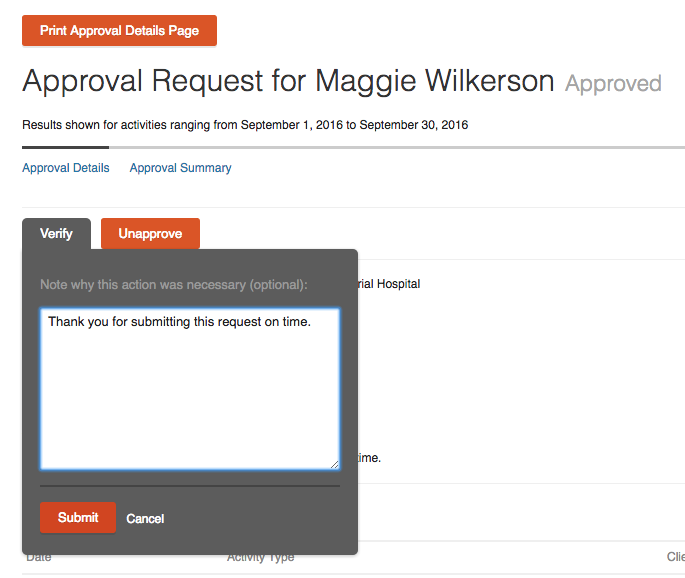 Use the filtering options to find the approval request you're looking for, then click the Placement to view the details of that request. You can also see an overview of the approval request by clicking Approval Summary. If an approval request has been approved by a supervisor, the status will be Approved. You will then have the option to Verify or Unapprove the request. Once a trainee's hours are verified by you, their supervisor can't change whether an approval request is approved or rejected. If needed, you can always unverify a request by clicking Unverify in the approval request details, which will allow the supervisor to change the status of the request. Go to Approvals to see a list of all approval requests that your trainees have sent, then click the Placement for the approval request you'd like to verify or unapprove. If you agree with the supervisor's decision to approve the request, you can choose Verify. When you click Verify, a popup box will allow you to add a comment. This comment becomes part of the record of the request. If you do not agree with the supervisor's decision to approve the request, you can choose Unapprove. 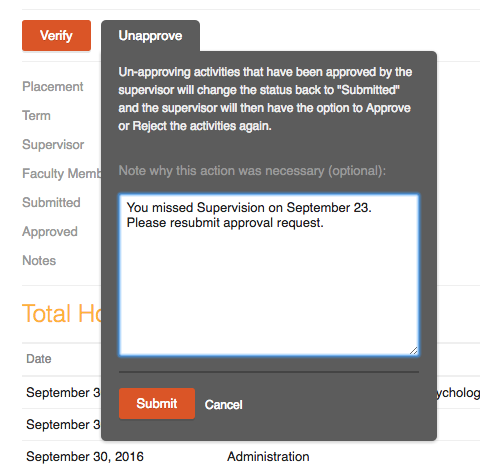 This will change the status back to Submitted and the supervisor will then have the option to Approve or Reject the activities again. You will also have the option to add a comment. If an approval request has been rejected by a supervisor, the status will be Rejected. You will then have the option to Verify or Un-reject the request. 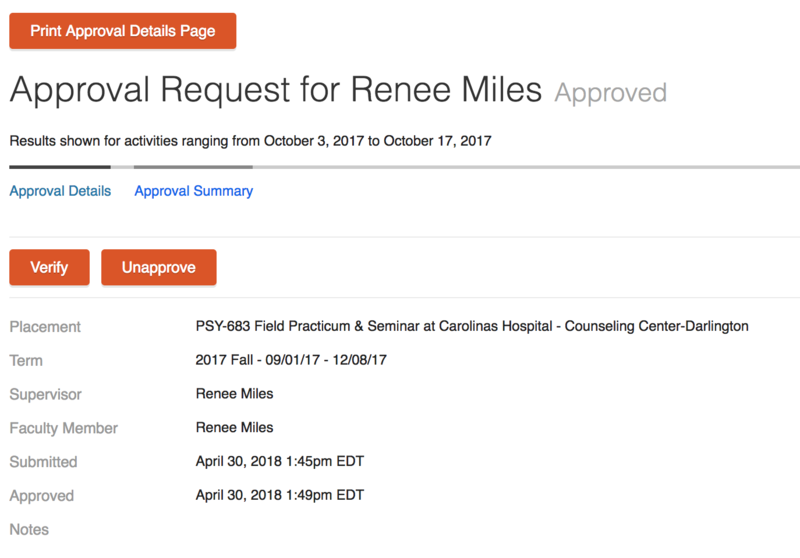 Go to Approvals to see a list of all approval requests that your trainees have sent, then click the Placement for the approval request you'd like to verify or un-reject. If you agree with the supervisor's decision to reject the request, you can choose Verify. When you click Verify, a popup box will allow you to add a comment. If you do not agree with the supervisor's decision to reject the request, you can choose Un-reject. 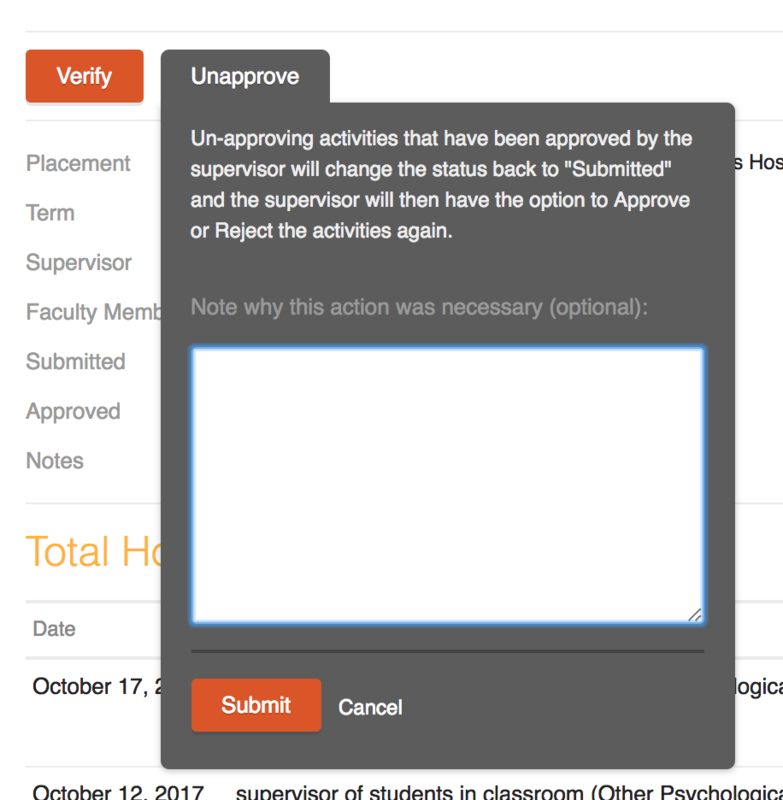 This will change the status back to Submitted and the supervisor will then have the option to Approve or Reject the activities again. You will also have the option to add a comment. In some cases, a supervisor may not be willing to use Time2Track or may no longer be supervising the trainee. In these cases, faculty can approve or reject trainee hours on behalf of the supervisor if the approval request status is Submitted. 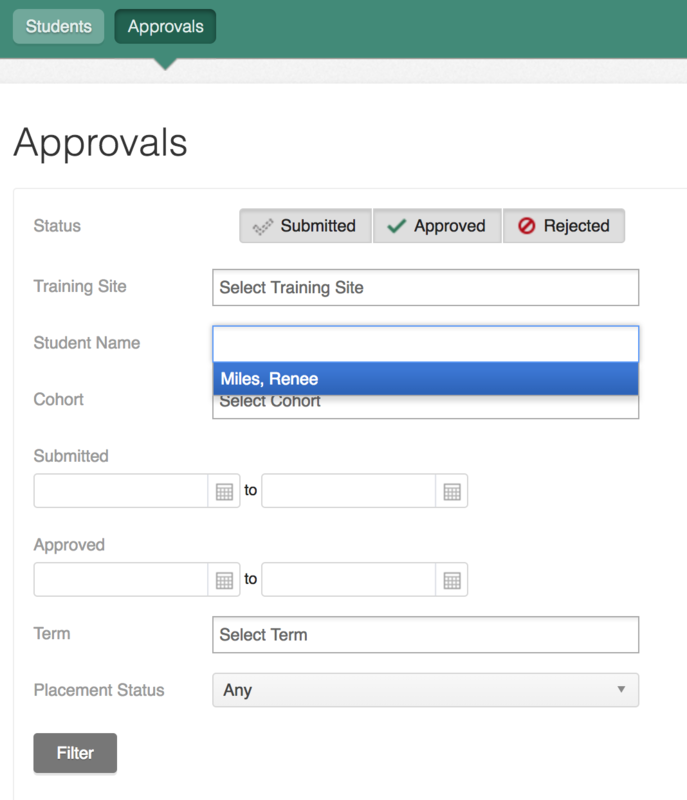 Go to Approvals to see a list of all approval requests that your trainees have sent, then click the Placement for the approval request you'd like to approve or reject on behalf of a supervisor. The status of the approval request must be Submitted. Here, you will see the activity details of this trainee's approval request. 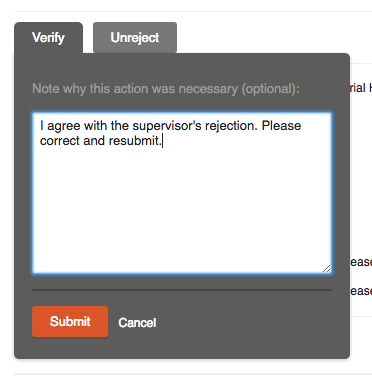 After reviewing the details for accuracy, you can choose Approve & Verify or Reject & Verify the request. To approve a request, click Approve & Verify. You can also add a comment here for the trainee. The comment becomes part of the approval request record. To reject a request, click Reject & Verify and add a comment explaining why you rejected it and what the trainee should do to correct it. The trainee can then resubmit the request after making the appropriate changes. 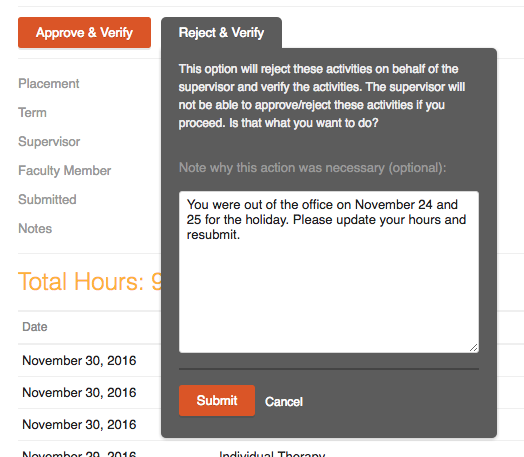 You can log into your account at any time and view all of your trainees' approval requests. With a faculty role you have the ability to unapprove a trainee's hours. Follow the steps below to unapprove hours that have been approved. Click on the Approvals tab. When "Unapprove" is clicked, you'll have the option to enter a note in the blank that appears. If you choose not to enter anything, click "Submit". If you need to reject hours for a trainee who should not receive credit due to failing a class, follow these instructions. Some forms and evaluations in Time2Track are completed by your trainee but also requires your review and signature. When your trainee completes and submits a form, you will receive an alert email from Time2Track letting you know. You can click the link in that email to be taken directly to your Time2Track account or you can log into your Time2Track account here and click the Forms tab to access your forms and evaluations. To access a form that is sent to you to complete, go to the My Forms sub-tab under Forms and click the Continue Submission button. When the form opens, fill out the sections that are assigned to you (Faculty) and then click Complete "Faculty Member" Step. You may notice that some information may be automatically populated for you. Note: Clicking Save will save your information so you can come back and complete the rest of the form later. Clicking Submit Form will route the form to the next recipient in the form workflow. The Submissions screen will show you a list of all placements that your trainees have created in Time2Track. If a placement or trainee is not listed here, that means the trainee has not set up a placement. If a trainee has submitted hours to multiple supervisors at a placement, each supervisor will be listed in a separate line. Note that you can also access forms on this screen that you need to complete. To view a trainee's form, click on the View button to the right of the placement. While viewing the form, you have the option to Print at the bottom of the page. Just click the Print button and then follow the steps for the browser you are using. If you choose not to print the form, click Cancel to exit and return to the Submissions screen. You can log into your account at any time and view all of your new and submitted forms and evaluations. You'll also receive email notifications when a form or evaluation is submitted to you, so make sure you add Time2Track to your safe sender's list. Sometimes you may have the need to edit a form or evaluation that you've already submitted. In these cases, you can choose to unsubmit the evaluation, make your changes, then submit the form again. To unsubmit and edit a form/evaluation, go to My Forms under the Forms tab and click View Submission beside the form you'd like to edit. Click Unsubmit and Edit at the bottom of the form, make your changes, then follow the steps above to submit the form again.